On August 2, some former Soviet Republics celebrate Airborne Forces Day. Such a date was chosen to commemorate the first parachute jump of the Soviet Airborne Troops that took place on August 2, 1930 in the Moscow Military District. The day of this experimental jump is regarded as the birthday of the Soviet Airborne Forces. However, the first full-fledged airborne brigade in the USSR was established in 1932. Over the next decade, airborne forces continued to grow. During WWII, they were mostly used as “foot infantry”. After the war, their development continued further. Following the dissolution of the Soviet Union, most republics inherited a certain number of airborne brigades and formed their own airborne forces. Following the collapse of the USSR, some former Soviet republics decided to abolish Airborne Forces Day. However, it is still officially celebrated in Russia, Belarus and Kazakhstan. In many cities and towns, Airborne Forces Day is marked with official ceremonies, parades, open-air concerts and even firework displays. On their professional holiday, servicemen and veterans of the Airborne Troops usually wear blue berets and telnyashka shirts, which are iconic parts of their uniform. 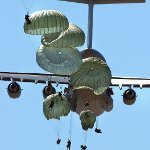 Due to this, paratroopers are often nicknamed Blue Berets.